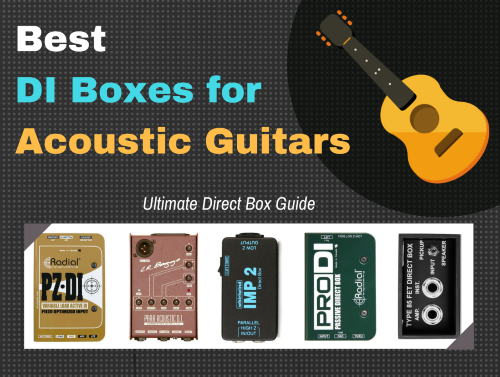 Let’s get your guitar tone sounding right with the best DI box for acoustic guitar. Quick answer: The best choice is the Radial PZ-DI, an active DI built and designed specifically for acoustic instruments. This is followed by the LR Baggs Para Acoustic DI which is similar, but costs a little less and so it’s a little more popular. If you’re on a budget, and want something for cheap, the Whirlwind IMP 2 passive DI is one that also gets good ratings. 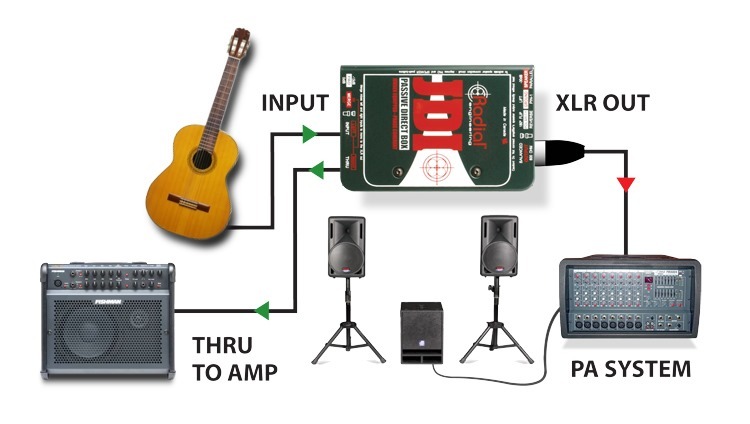 … for instance, do you need a DI for an acoustic guitar? It depends… reading the buying guide section of this post as well as FAQ will help you find out. Highlights A DI built specifically for the piezo pickup of acoustic instruments, it’s often a popular recommend, as it includes useful features like a pad, ground lift, and polarity switch. Users typically have good things to say about it. One of the better affordable active DIs out there. Though it misses a couple nice features (no ground lift or pads), its 5 band EQ and preamp makes it an overall great value buy and popular with acoustic guitar players. Perhaps the best low budget passive DI box out there that won’t disappoint. It misses a few high-end specs, but it does what it should and satisfies a lot of acoustic guitar players. The best value passive DI you can get for acoustic guitar. It’s not “cheap,”Radial Engineering ProDI but it’s built like a tank (literally) and offers one of the most satisfying results from a passive DI. A great middle road between high-end passive DI and “budget” DI. This is usually recommended by many acoustic guitar players for its true colorless tone. Take a look at these considerations for the best DI boxes. Make sure to look at the buying guide and FAQ section to make sure you're making the right choice for you. The Radial PZ-DI is the top choice in this guide for the best DI box for acoustic guitar, as well as being a popular recommendation in forums and other review sites. It’s a world-class DI that has everything you need: ground lift? Check. Polarity switch? Check. Pads? Check. It’s suitable for both stage and studio. It has the ability to handle high signal levels without distortion, so you’d be happy with the tone and consistency of the box. The Radial PZ-DI acoustic guitar DI is technically an active DI with the same kind of military grade board that comes with their other models. It’s a single channel DI, which inputs through one ¼” TRS connector, and outputs through a XLR connector and ¼” TRS thru. It comes with a ground lift switch which will disconnect the XLR pin-1 ground from the PZ-DI. This will eliminate any ground loop hums. It also features a -15 dB pad that you use when connecting super-hot inputs like an MPS player. In addition to the useful pad, there are a couple of filters. The variable high pass filter will be able to control and attenuate any bass resonances, while the low pass filter will help to warm up the high-end frequencies of your acoustic strumming. Various owners of the Radial PZ-DI around the internet have very positive reviews for the little device. User reviews have commented on it being "natural sounding." Another user noted that the features help with matching impedance with his guitar's pickup, which can be troublesome for some active DIs. There was virtually no complaint that could be found for this device in the research, though that may have to do with the fact that it is relatively less popular (since it's newer to the market). 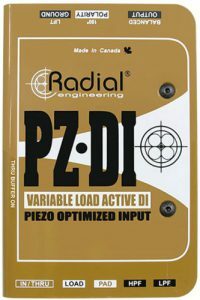 The Radial PZDI is, according the research, the best DI box for acoustic guitar that you can get. It’s not the cheapest, but there are more expensive options that will give you the same results. And from its super rugged design to thoughtful features intended for acoustic pickup, and clean natural sound, you can’t go wrong with it. The LR Baggs Para DI Acoustic is the buyer's choice DI for acoustic out there simply by popularity. There’s two main reasons for that. One, it’s a DI that’s actually made specifically for acoustic guitar (hence the name), so as a specialty DI, you can expect to work well. The other reason is that it actually a combo device, as it features not only a DI, but a built in preamp and 5-band EQ. For the price that you’re getting it, it’s quite a bargain then, and many buyers are happy with it, often recommending it first among DIs. 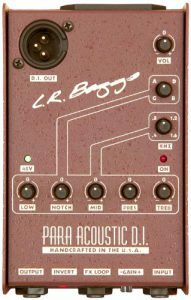 The LR Baggs Para DI Acoustic is an active direct box. It is primarily known as being great for live acoustic guitar performances, as it pairs perfectly with acoustic pickups, but works well in the studio also. Being portable, it’s powered by a 9V battery (up to 200 hours), but it can also run off +48 phantom power. This is a single channel DI box, which has phase inversion (polarity switch) to prevent feedback. The built-in equalizer will give you up +/- 12 dB of control. It also has -6 db high/low shelf control and a -12 db low cut feature. With these features you have the ability the sculpt and shape your acoustic guitar tone right out of the box. It also provides sufficient gain, all the way up to +24 dB, useful for situations where you need more power. As of writing this guide, LR Baggs Para DI Acoustic is the most popular DI box that I recommend. That is primarily probably because it’s bought as a guitar preamp as well. Many users like the fact that it pairs very nicely with their piezo pickup, producing a detailed clear sound. Many also like how their guitar tone is shaped thanks to the EQ. Critical reviewers note the tone, while great, is not the best you can get out there, noting that the true value of the LR Baggs Para DI Acoustic is not so much in the sound quality, but the combination of features it gives you. According to the research, in my opinion LR Baggs Para DI Acoustic remains an excellent value buy if you’re looking for something a little more than a passive DI. There are a couple critical reviews, but the vast majority of owners are happy with it. There are many passive DIs out there that you can get for cheap. Some of them are good, some not so good. But if you’re looking for a cheap DI that’s actually good and is consistently rated as super reliable by the pros, take a look at the no-frills Whirlwind IMP 2. For a fraction of the cost (and some features) this DI can produce some really good results for your acoustic guitar performances and recordings. The Whirlwind IMP 2 is a passive DI with single channel that will convert your acoustic guitar’s unbalanced signal to a mic-level balanced signal. It has a ¼ inch TRS input, and two outputs, XLR and ¼ inch thru. The DI comes with a ground lift switch which will help to keep the hum and buzz down to a minimum. The construction is “road-tough” with a metal body, and a transformer riveted to the chassis instead of glued. This is great for obvious reasons, no worries over the potential for internal components being jolted loose. Being a low-cost unit, it is one of the most popularly bought. Users online claim that there is “nothing better for the price.” Others say it “works as it should.” Critical comments came from users who found that it doesn’t produce the level of quality found in high-end passive DIs with higher quality transformers (like the ProDI). Overall, the reviews from buyers are consistent: top quality for the price, but don’t raise your expectations too high and you won't be disappointed. 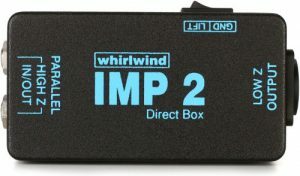 The Whirlwind IMP 2 is the best cheap passive DI out there for acoustic guitar. If you’re on a budget and need a few, you’d be happy with this option. The Radial direct boxes are considered some of the best in the industry. But while some of them might be outside of some user’s budget (like the legendary Radial JDI), especially if you’re picking up a few, there’s an option for a great passive direct box that offers one of the best price-to-value ratios out there. The Radial ProD is basically that option for you. A consistently high rated DI for all instruments, not just acoustic guitar, with high class transformer that will performance at the best level. Like the name suggests, it’s “pro” worthy. 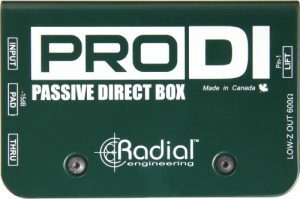 The Radial ProDI is a single-channel passive direct box that works excellently on acoustic guitars. It features custom-made transformer, with 100% isolation that eliminates noise and saturation. The transformer is rated as having a very low phase distortion, especially in the low-end and mid frequencies. Like its bigger brother, the JDI, it’s made out of military grade material, so it’s literally built like a tank, and can take some vigorous treatment on the road. Of high importance, it features a ground lift switch will help eliminate excess noise. The -15 dB pad is also included which will provide useful for removing distortion from super-hot audio sources (like an MP3 player, laptop, or CD player). You’d be hard pressed to find an entirely critical user review of the ProDI. It’s one of the more popular passive DIs out there, since it is affordable and more accessible. A favorite anecdotal comment comes from a buyer who used the DI without telling anyone he switched. Immediately he was getting compliments on the sound of his acoustic guitar. The Radial ProDI is the DI to get if you want something in that's well priced, has essential features, and would most likely not disappoint you on stage or in the studio. For that reason, it is best value passive DI for acoustic guitar players and recording engineers. If you’re in the market for an active DI for your acoustic guitar, the Countryman Type 85 is pretty much the best option out there. In fact, it could easily take the spot for best value, if the rating system was based on which active DI box was best for acoustic guitars. It could potentially take the top spot if the PZ-DI wasn't particularly designed for acoustic instruments. But this is still suitably useful for acoustic guitar recording or performances. The direct box is well designed, very solid, and characterized as providing a tight, detailed sound. As mentioned, the Countryman Type 85 is an active DI, with a single channel input and two outputs. It utilizes a power source of 48V phantom power to get running, or you can add a 9V battery. It includes a ground lift, but it lacks the polarity switch and pad. “Unnecessary bells and whistles” for some users, but a consideration nonetheless. As an active DI, is it especially useful if you know your guitar needs to be re-amped in your signal chain accurately. As far as construction goes, it’s tough and can take a beating, thanks to its no frills design. Forum users often recommend the Countryman Type 85 to general users, but I’ve found buyers who’s been happy with it for the acoustic guitar, both on Amazon and elsewhere. One user uses for keyboards, basses, and acoustic guitars. There are no unsatisfied or critical reviews of the DI that could be found for this research. If you want a general purpose active DI box for your acoustic guitar, the best choice would be the Countryman Type 85. It’s fairly priced, and comes with the essentials of what you need to get a good guitar tone without trying to impress. What is a DI (AKA Direct Box)? A direct box, very commonly just referred to as just “DI box” or just “DI,” does a very simple and basic task: Isolates your unbalanced signals, and transforms them into balanced line level signals. That’s a great explanation if you are familiar with some of the terms I’ve used, but before we move forward, for the uninitiated, let’s get a basic explanation of some of the terms I just used to make sure that we’re on the same page. An unbalanced signal is a signal that comes from most stage instruments, as well as the majority of consumer electronics (like CD players, laptop headphones out, tablets, etc). Because of the type of connectors necessary for these audio sources, the signal is prone to noise and interference. This is due to the internal wiring necessary to carry that connection (i.e. one single signal wire + one grounding wire). A balanced signal, on the other hand, uses two signal wires plus a grounding wire. One of the signal wires is flipped in polarity, which is then flipped back by the receiving gear. What this does is cancels out the noise and interference that the signal may have picked up traveling along the wire. For a more detailed explanation, you can read more about the difference between balanced and unbalanced signals here. The line level is the standard strength of an audio signal, measured in volts. You can see this implied by gear that has a “line in” or “line out” usually around the back. Think of it as the “operating signal” which allows all your gear to communicate with each other on the same level. If it’s gear that’s sending signals, like a studio microphone or instrument, the signal needs to be strong enough for your line-level gear to register it. If the signal is coming from a consumer product like an phone, tablet, CD player, laptop, then the line will be “too hot,” that is, too loud, and it should be attenuated to meet the requirements of professional audio. You can read more about line-level from Wikipedia. Just as with finding the right DI for an electric guitar, acoustic players need to get the right direct box for their sound. From reading the overview above of the important properties of an audio signal, you’d realize that recording or playing live sound is not such a simple matter of plug-and-play. Most likely, the signal that comes from your instrument, tablet, or MP3 player will be unbalanced, resulting in an unpleasant humming sound. Professional studio microphones will pretty much always produce a balanced signal. So using a good microphone with preamp is an alternative option for getting a good balanced sound. However, as some people may note, this can lead to unsatisfactory and even frustrating results, since capturing an accurate acoustic guitar tone via microphone can be very difficult. The alternative is to use the output signal that comes from an acoustic guitar pickup. This provides the benefit of a more consist tone that you can control and shape via EQ plugins in your DAW or the controls on your mixer. But as instrument output signals, they are unbalanced, and hence the requirement of a DI box. The most basic difference between DI boxes is that an active DI requires power to work, a passive DI doesn’t. The active DIs use either a battery, or can be powered by phantom power or an external power supply. But the main difference is that an active DI box can act as a preamp for a low-impedance sound source, such as microphone or a passive pickup of an acoustic guitar. However, there is a big disadvantage to most active DIs that cause many to prefer using a passive DI when recording or mixing acoustic guitars. Low quality active DIs are notorious for adding noise and coloration to the audio signals. Passive DIs are simply transformers that turn unbalanced signals to balanced signals, effectively canceling noise in your audio signal. However, passive DIs, acting as simple transformers, may only pass along a weak audio signal, necessitating the use of a preamp. While there are some great quality active DIs out there, the preference is for an active DI that is specially build for the sort of pickup used on acoustic instruments, such as the Radial PZ-DI or the LR Baggs Acoustic. Some people, however, prefer to use passive DIs that are pure direct boxes that don't add any re-amplifications. Good examples of these are the Radial ProDI or the Whirlwind IMP 2. For more information on what a DI is and how they work, check out or article on the subject. On a DI box you will often see a connection labeled "thru" or "bypass." This simply splits the instrument-level signal you plug into the input of your DI into a separate output. This is useful for sending an unprocessed signal to a PA or amp. This can also be called a phase switch, or reverse. Some DI boxes come with it, allowing you to change from Pin 2 hot to Pin 3 hot configuration. Why is this useful? Sometimes there can be a problem with the way your XLR cables are wired. It can also help to eliminate feedback, which is great if your mixer doesn't have that feature. What is a pad on a DI box for? Audio signals coming from consumer electronics, like MP3 players and laptops, tend to be "too hot," and therefore will overwhelm the transformer's circuitry inside the DI box. A pad that will attenuate that incoming signal will prove to be useful in this case. How to use a DI box for acoustic guitar? The standard approach is to plug your acoustic guitar directly into the direct box, then from the XLR out, straight to your mixer. If your guitar requires a preamp, your preamp will get between the the DI box and your mixer. If you're using an amp to monitor your recording or playing, plug them into the "thru" or "bypass" located on the DI. Refer to the image at the top of the guide. What does ground lift do? Even though DI boxes are great for eliminating the noise caused by an unbalanced signal, there is still a potential for a hum. This can be caused by either a faulty grounding wire, or by two pieces of equipment in your sound system connected to earth by their main cables. If this is the case, you need something called a "ground lift" that will break the connection to electrical earth, minimizing the hum loop that may result. 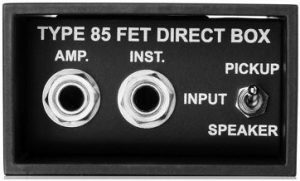 Is a DI box a preamp? Some DI boxes can function as a preamp if they a fitted with built-in preamp. This is the case for active DIs. But they are used for the purpose of matching levels and impedance. The main difference is that DIs function to minimize noise by creating balanced signals, whereas a preamp is used to raise the level of passive signal to line level. Is a DI box necessary for acoustic guitar? In the home studio context, audio interfaces with an "instrument input/line-in" should be sufficient to record your acoustic guitar, since audio interfaces with these inputs will have the necessary circuitry. Otherwise, you many need a DI box if you are not getting satisfactory sound. Additionally, if you are running long wires, for instance when playing on stage, a DI box will prove to be necessary, as noise tends to build up in long tables. Hopefully by the end of this guide you would've become quite acquainted with the DI boxes that are on the market, as well as figure out if one is right for you, and if so, which one. There are so many DI boxes out there. Some of them are great, many of them not so great. I should know, in this research, dozens of DI boxes had to be sorted through. 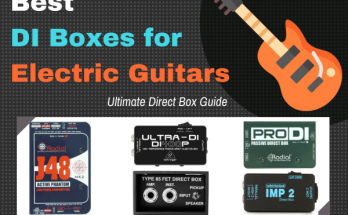 And while it turns out that many DI boxes can be great for acoustic guitars, we quickly realize that making the right selection wasn't just a matter of whether or not it had a lot of positive votes on Amazon. If you have any questions or comments, or maybe some opinions on what you think are the best DI boxes for acoustic guitar, please leave them in the comment box below. Otherwise, remember to share this post with your friends, or with someone you think will find it useful. Dozens of hours went into the research for this post. Product recommendations came from a combination of Gearslutz users, Reddit users, as well as customer reviews on Amazon and other pro audio online stores. 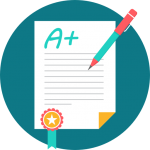 The products were then individually researched to see if they suited the use of acoustic guitars, and then a further research of Amazon and other user reviews online was undertaken to make sure that only top results came forward. While there are many good picks, the results were also selected based on budget, as well a specification, as no two acoustic guitar player will be the same. The result is a few out of the many DI boxes out there that are suitable for acoustic guitars that you can assure will be safe buying options.